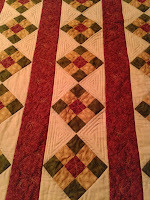 Hazel's Quilts: Now Where Were We...? Now that I've completed the Festive Mystery quilt (I'll post pics when I remember to take some in daylight), I'm turning my attention to getting on with mum's quilt. It has taken a great deal of willpower not to dive in and join in with Lynn's Country Charmer, which is just the prettiest scrappy quilt, but I have kept mum waiting far too long already for me to finish hers. Those with the memory of an elephant may be able to cast their minds back to last May when I last worked in the quilt, and recall that mum chose one of QuiltSue's wonderful designs from her most excellent book, Pick Four. To recap, mum, big sister Helen and I went to the Cotton Patch last Spring and chose fabrics to complement her curtains and carpet; I pieced the top, and am about two thirds of the way through quilting it. Back to now, I've spent a couple of evenings continuing with the geometric infill of the cream sections. 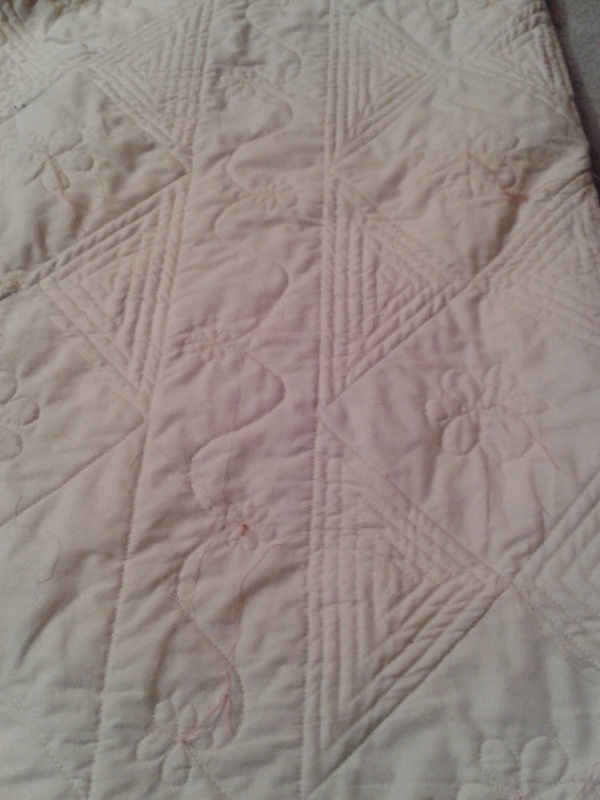 This is a right bloody faff, as I'm using the walking foot in order to keep the lines straight and the stitches even, and every time I turn a corner I have to manhandle the quilt round for the next run. I'm about half way through, then after that I will re-do the daisies in the middle of the nine patches - I don't like them as they are, so I'll stitch in the ditch around each square of the nine patch and quilt a little daisy right in the middle. That's the plan - at the mo - anyway! Your work is really lovely. You have a nice plan for finishing it. Thank you, Joanna - although the plan is one thing, finishing it is another! You are doing a great job Hazel. I know how hard it is to machine quilt on a domestic machine and I appreciate your work! Thank you, Lynn - it's just as well that I don't have anything to compare it to, Lynn, or I suspect that it really would drive me mad! Hazel, your quilt is coming along really well! The geometric pattern may be a lot of work, but it sure looks great! I love how you're quilting this and I have an idea about your daisies that would save you having to unpick them. How about simply echoing them a couple of times so they pretty much fill the blocks? Thank you for the suggestion, Sue - I'm going to try that out on a couple of blocks to see if I'm happy with it. As for the 9-patch blocks, doing SID will make a tremendous difference and you may well find you don't feel the need to do additional daisies after that. ...and yet I do like the idea of the daisies as they will echo those in the borders. Mind you, they might look a bit 'lost' and end up looking like iced gems! A test is most certainly in order. I'll admit, that I can't handle a large quilt under a domestic machine, so I think your are doing great. I think I agree with Bilbo about the nine patch blocks. Take it slow and easy and it'll soon be finished and you can then sew down the binding, which I always feel is so good knowing I've actually achieved something. The quilt is looking great. 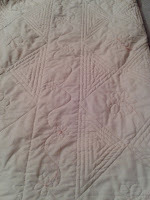 I use a walking foot for geometric designs too and the last time I did it I finally realized that if I stitched using "reverse" on some stretches, I wouldn't have to turn the quilt completely around every time the quilting turned a corner. The only trick was to remember to switch back to "forward" again at the appropriate corners (I did forget a time or two). I'm not sure I've explained this well, but I hope it can help you with the quilt wrestling. Actually, I'm going to have another look at the machine to see if I can double-click it in, or use tape on the button, or something.